Stoke-on-Trent Taekwondo (ST1): A Korean martial art that was developed during the 1940's, Taekwondo has continued to grow in popularity since then. If you would like to learn a bit of self-defence, build your confidence, enhance your self-esteem and strengthen your mind and body, Taekwondo might be just the activity for you. Taekwondo is generally a lot more demanding physically than for example Tai Chi, so unless you are pretty fit and agile you might prefer to find something a little gentler to improve your fitness in Stoke-on-Trent. Younger children are certainly the perfect participants for Taekwondo classes in Stoke-on-Trent, with lots of fast movements going on and plenty of high kicking. Taekwondo was only developed quite recently in Korea (1945). Some exciting new schools called "kwans", combining various martial arts techniques were established in Seoul by a group of Korean martial arts lovers. 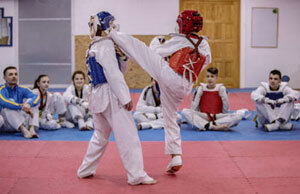 Kicking manoeuvres, especially fast kicking methods, jumping/spinning kicks and head kicks are the main emphasis of Taekwondo, as it later became known. These days Stoke-on-Trent Taekwondo classes stick to this tradition. Of all the many benefits of doing this sport, it is the self-defence aspect of Taekwondo that the people of Stoke-on-Trent find most appealing. And in these days of increased violence, especially in town and city centres, it is no surprise that this features high on people's list of priorities. The ability to defend yourself and at the same time exercising self-restraint and a respect for others is one of the key benefits of Taekwondo. Your First Stoke-on-Trent Taekwondo Lesson: If you have never done Taekwondo before you may be a little concerned as to what to expect on your first class. This will vary from school to school but will usually involve some or all of the following. A 15-20 minute warm up to increase heart rate and loosen muscles, some technical training involving learning some stances, hand attacks, blocks and kicks, learning some forms (or Poomse), an introduction to sparring including movement, timing and the targeting of attacks, and lastly a warm down to relax and stretch tired muscles. Stoke-on-Trent Taekwondo classes aren't only suitable for people in Stoke-on-Trent but also for followers from Etruria, Mount Pleasant, May Bank, Barlaston, Springfields, Trentham, Boothen, Audley, Hanley, Longton, Blurton, Fulford, Clayton, Newcastle-under-Lyme, Shelton, Fenton, Keele, Wolstanton, Dresden and other Staffordshire places. 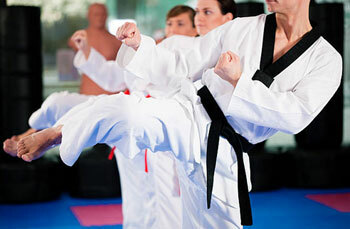 Taekwondo Tournaments: Taekwondo competitions are held all over the world in all of the various styles. There is generally not much hard contact but patterns (forms), sparring and breaking. Olympic and WT (World Taekwondo) tournaments consist only of sparring, in ITF (International Taekwon-Do Federation) tournaments certain hand attacks are allowed to the head. Other organizations hold multi-discipline tournaments. Taekwondo Beginners Classes: Students starting out on their Taekwondo adventure in Stoke-on-Trent will at first sign up for a beginners class. Beginners classes are great, because there is no pressure and everything is done at a slow, relaxed pace. Learning and having fun are the main aims in the beginning and students who are having fun tend to learn much faster and absorb more of what they are being taught. Even Taekwondo masters started out as clueless novices, so take that first step and who knows where you will end up! Also find: Dresden Taekwondo, Clayton Taekwondo, Boothen Taekwondo, Springfields Taekwondo, Keele Taekwondo, Etruria Taekwondo, Wolstanton Taekwondo, Fulford Taekwondo, Mount Pleasant Taekwondo, Blurton Taekwondo, May Bank Taekwondo, Fenton Taekwondo, Longton Taekwondo, Hanley Taekwondo, Trentham Taekwondo, Newcastle-under-Lyme Taekwondo, Shelton Taekwondo, Audley Taekwondo, Barlaston Taekwondo and more.